That's Right, We're Not from Texas: No Bowl, but One in a Row! It might be one of the most bittersweet days in Vanderbilt Football history. After a 4-0 start this season the 'Dores dropped six games in a row, including a two-point loss to MTSU (when a Vanderbilt field goal was blocked in the closing seconds), a double overtime loss at Florida (when a bogus excessive celebration penalty kept the 'Dores from going for a two point conversion to potentially win the game in regulation), a 28-35 loss at South Carolina (after coming back from being down 14-28 in the 4th quarter to tie the ballgame) and a 43-48 loss to Kentucky (after Vandy trailed 34-3 in the first half). The Commodores came into Knoxville with their bowl hopes dashed and nothing but pride on the line as they attempted to end a 22-game losing streak at the hands of the Vols. The last time they beat UT, I was nine years old. 23 years later, I was at Neyland Stadium to see the streak come to an end. 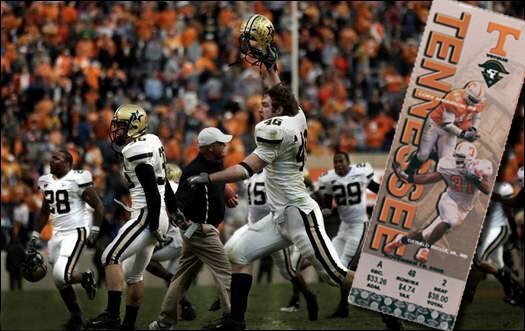 As anybody reading this knows, Vanderbilt came away from Neyland Stadium in Knoxville with a heart-stopping 28-24 win. In a series where Vanderbilt has consistently gone into games as the heavy underdog, but where six of the last 11 meetings have been decided by seven points or less, Vandy was due, and this was the team with the guts and the talent to pull it off. Granted, UT is down this season, but the Volunteer defense is still one of the most formidable in the nation. Jay Cutler and Co. put up 28 points on them with 21 of their tally coming in the first half. The Vol defense stiffened to hold Vandy off the scoreboard until their final 63-yard, 29-second scoring drive which culminated in Cutler drilling Earl Bennett on a quick slant in the endzone with 1:11 left on the clock. In an effort typical of Vanderbilt's early success this season, the defense bent but didn't break in the closing moments. Redshirt freshman cornerback Jared Fagan intercepted Rick Clausen's last gasp 4th down pass to the endzone as time expired to seal the victory. The short-handed Vanderbilt offensive line performed admirably. Marlon White made two big touchdown catches. George Smith made one of the most incredible catches of the season pulling an underthrown ball out of the grasp of a Tennessee defensive back in mid-air. Cassen Jackson-Garrison, a Knoxville native, played one of the best games of his young career with his running back mate Jeff Jennings on the sidelines after suffering a season ending injury against Kentucky. He rushed for 60 yards and caught 3 passes out of the backfield for another 49 yards. True freshman Bennett, who came to Vanderbilt because no other program would let him play wide receiver, had another stellar game, making 14 catches for 167 yards en route to breaking the SEC record for freshman receptions with 79 (49 of which were in the final four games of the season). As for Cutler, what can you say other than he will go down as the most prolific quarterback in Vanderbilt history. He deserved a swan song like this, completing 27 of 39 passes for 315 yards and 3 touchdowns, no interceptions, one big win and the hope of a bright future in the NFL. UT fans will never understand what this feels like. I wouldn't trade this win for anything (although it would have been nice to have that bowl game invitation too).